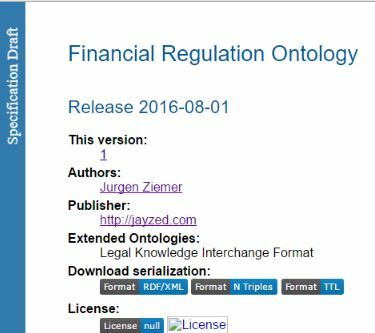 FinRegOnt derived from the Hedge Fund Regulation ontology (HFR). The semantic approach to compliance implements a hierarchy of defined classes for filing requirements, exceptions, and classification. The inference engine (reasoner) uses asserted information to place matching Funds, Advisers, and Assets as inferred members of the defined class. For lineage tractability, we want the defined class linked to the actual paragraph of the regulation. Rather than having endless spreadsheets, we load the regulation into the ontology. Querying from regulation to implementation shows the classes, where a particular requirement has been implemented. The regulatory classes for Code of Federal Regulations (CFR) and United States Code (USC) are not specific to Alternative Investments, not even specific to finance. All USC and CFR XML can be loaded into the ontology. The XML provided by the Government Publishing office and Office of the Law Revision Council is a great service to the public. Hopefully soon, it will be even better with RDF/OWL semantic endpoints integrating all US E-Government. banks in North America, Europe and Asia since 1999. Jurgen Ziemer was an IBM Industry Models, Banking Data Warehouse Consultant for 6 ½ years. Leading data architecture for Bank compliance projects since Basel II in 2003. I converted from data modeling to ontologies three years ago. Using OWL, I can define business constraints as axioms of the class structure. Executable business rules can be formulated in defined classes and semantic web rules. Traditional architecture has all these components separately (RDBMS, ETL, rules engine …). Different metadata representations make it so hard to integrate.